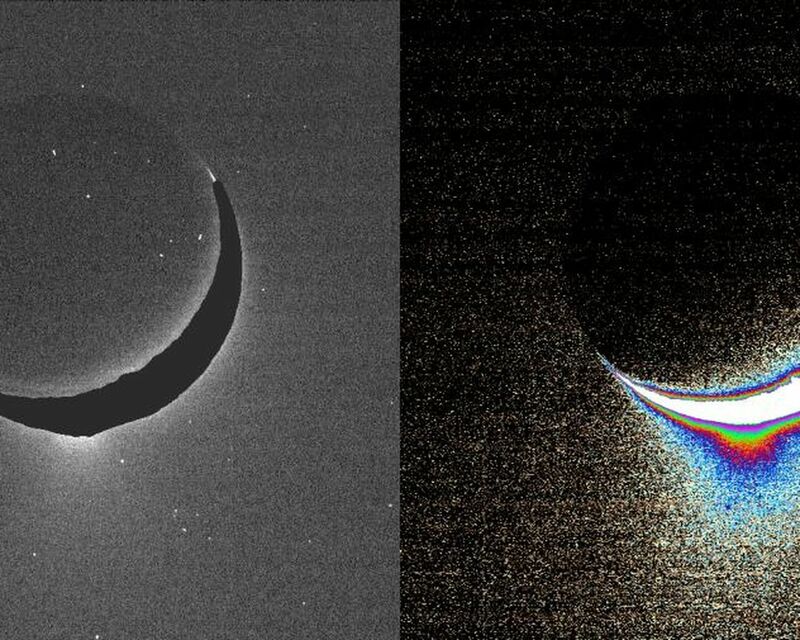 Plumes of icy material extend above the southern polar region of Saturn's moon Enceladus, as imaged by the Cassini spacecraft in January 2005. 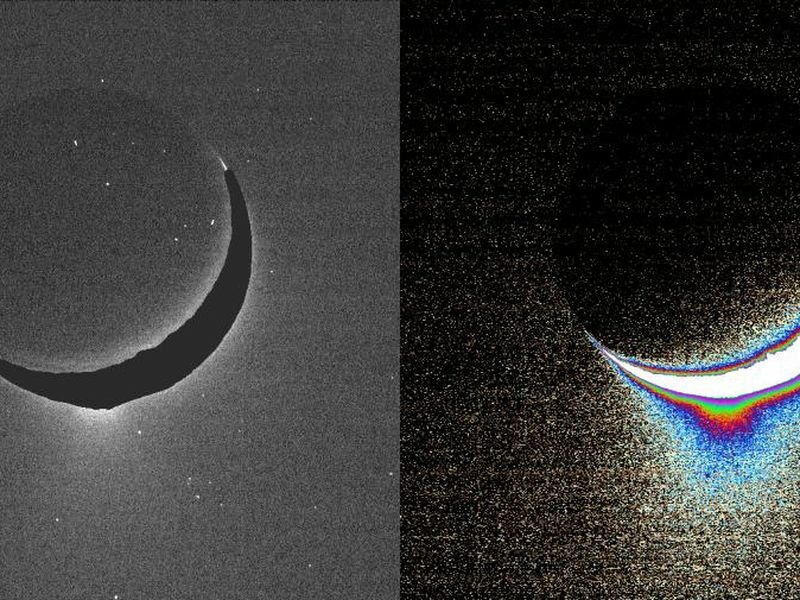 The monochrome view is presented along with a color-coded image on the right. The view in this image is perpendicular to the tiger stripe fractures that straddle the south pole. Another plume view, PIA07798, was taken one month later and looks along the tiger stripe fractures. See PIA06247 for a view of the tiger stripe features. Images like these are being analyzed by scientists as they seek to explain the processes that could be producing such incredible features. As reported in the journal Science on March 10, 2006, imaging scientists believe that the plumes are geysers erupting from pressurized subsurface reservoirs of liquid water above 273 degrees Kelvin (0 degrees Celsius). These images were taken with the Cassini spacecraft narrow-angle camera at a distance of approximately 209,400 kilometers (130,100 miles) from Enceladus at a Sun-Enceladus-spacecraft, or phase, angle of 148 degrees. The image scale is about 1.3 kilometer (0.8 mile) per pixel. A slightly different version of this image product was released in Nov. 2005. See PIA07760. The mosaic is an orthographic projection centered at 46.8 degrees south latitude, 188 degrees west longitude, and has an image scale of 67 meters (220 feet) per pixel. 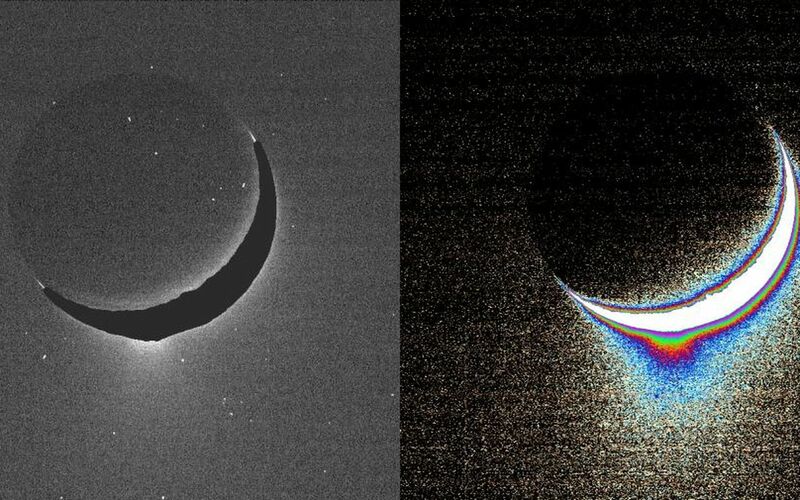 The original images ranged in resolution from 67 meters per pixel to 350 meters (1,150 feet) per pixel and were taken at distances ranging from 11,100 to 61,300 kilometers (6,900 to miles) from Enceladus.